Looks to be a nice day to travel–a mere 2.5 hours–from the ONE-STOP town and county of Floyd to the far busier and busier than usual University town of Charlottesville. The Banff Film Festival was in town this week, too, so the joints a’ hoppin’, especially for someone coming from the quiet of Goose Creek. I have some events coming up, and wanted to reproduce my original “visual essay” from PowerPoint into a Mac-compatible program (Fotomagico) and that is done: some sixty images and about 15 minutes of narrative around the topics of sense of place, familiarity with the creatures around us, and a return to curiosity and a sense of wonder out-doors, especially for our kids. The first time I’ll present this program will be April 12 at Wytheville Community College at 7 pm. Location TBA. Well, I’ll hope to check in here (and on Facebook and Twitter) off and on to bring you up to speed on the Festival of the Book and related goings-on–if indeed there are any. I’m going to do my best to stay out of trouble while watching others who probably aren’t. I’ll be taking notes! 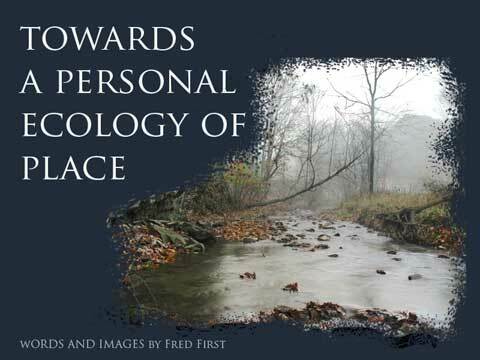 Sounds like a very interesting presentation-Sense of Place. Bill MacLeish, the author of “Oil an Water, the Struggle for Georgia’s Banks”, “Uphill With Archie”, and other notable writings is presently writing a book about our sense of place and the natural world. A very interesting topic. Be careful out there among them English!